STOOPID WIT? Sure! 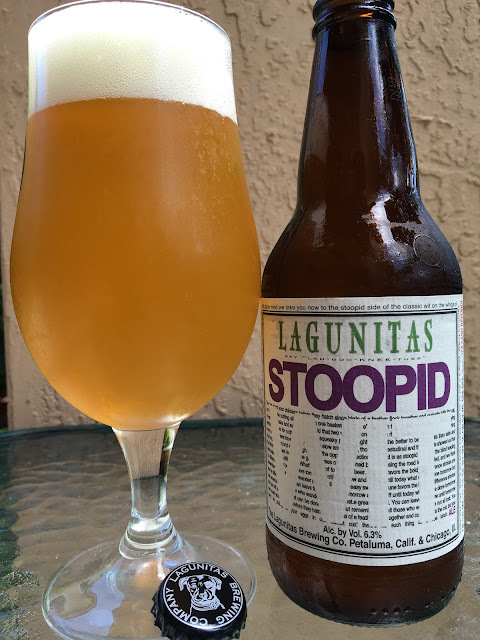 Lagunitas calls this "An Un-Freakin'-Filtered Hoppy Belgian-ish Wit." There's a story beneath the giant WIT that is pretty much unreadable, though there are glimpses of phrases such as "count your chickens before they hatch" and, wait, everything looks like a part of a common idiom. At least around the edge of the label, you get the normal banter... "The Bard said that it's better to be a witty fool than a foolish wit. True dat. Wit dat in mind we take you now to the stoopid side of the classic wit on the wings of Yakima's finest. What's it got to do with beer? Give us a call. 707.769.4495. Cheers!" 6.3% alcohol. Orange, wheat, spicy aroma. Big grainy and wheaty flavors to start and always there. Yet juicy, lemony, hoppy, very fruity. Nice chewy texture with a little wheaty twang at the finish. There is a strange bitterness in the aftertaste that I didn't love. Not bad but there are 10 Lagunitas beers I will drink before this one.